Does your dog love tennis balls? Then give flygility a go. 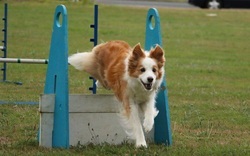 The ultimate goal is for your dog to do a series of obstacles then hit a box which releases a tennis ball. They grab the ball and run back over the obstacles and come back to you! Seems impossible? 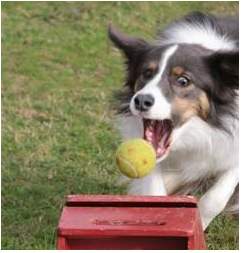 Using our positive training methods dogs quickly get really excited by this fun game and really do play their part. We train Flygility during Day Light Saving months, October - March. We hold regular flygility tournaments where you can pit your dog's speed against others' and earn points toward a title of Flygility Dog, Flygility Dog Champ or even Fly Dog Grand Champ. 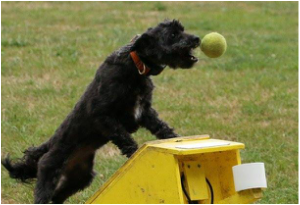 We recommend your dogs have trained at DAWG's Level 1 before trying Flygility training, or at the very least a minimum of our Foundation Course (or equivillent). Please tell us your dog's age and breed. This will help us answer your enquiry.